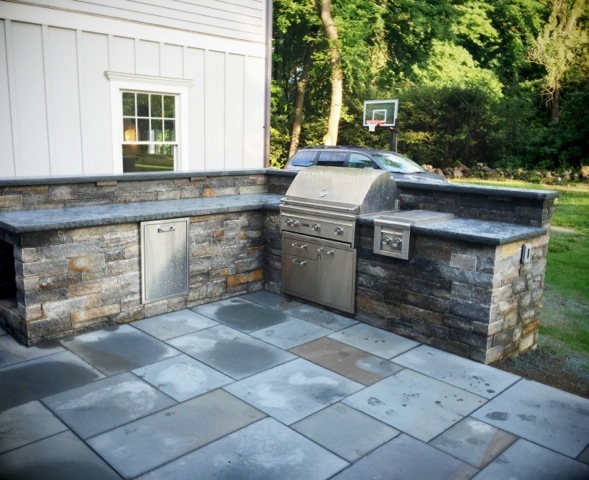 Just one look at this outdoor kitchen crafted with Connecticut fieldstone and it’s easy to see why it is a growing trend amongst Connecticut residents. The way the square and rectangular stones are impeccably placed together paired with the gorgeous variety of naturally occurring colors makes it a beautiful addition to any home. This outdoor kitchen also features a stunning two-inch honed bluestone cap for additional contrast and extra durability. While most patios will offer overhead lighting, Connecticut homeowners love additional task lighting (a smaller light source strategically placed to aid in a specific task) on their outdoor kitchens. For the kitchen above, we installed subtle lights on the backsplash, and for the kitchen below, we went for built-in lamps on both sides of the grill. Either way, this trend provides a well-lit cooking area for the chef to prepare the meal, and once the sun goes down, the ambiance it creates will look amazing. For most Connecticut residents, they don’t have a say in the materials of their home itself, but they can have us use our custom masonry skills to make the entire area cohesive. 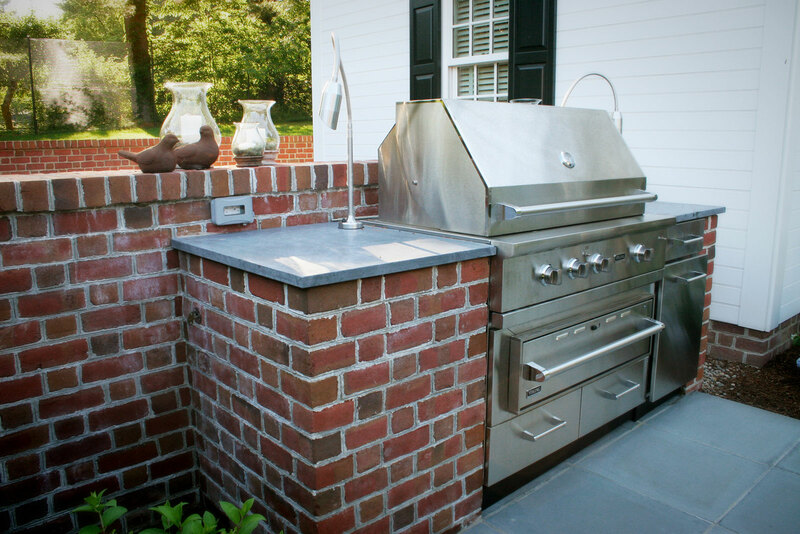 This can clearly be seen with the creation of this brick outdoor kitchen. The brick foundation on the home was built decades ago, yet the patio walls and outdoor kitchen mirror both the spacing and styling flawlessly. Outdoor kitchens surely need to be pleasing to look at, but they also have to be functional. That’s why soapstone countertops are so popular in Connecticut. 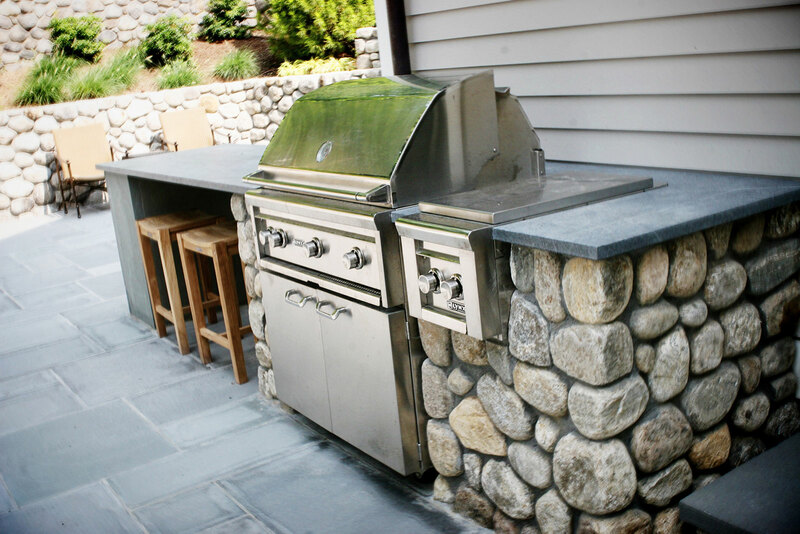 As you can see in this New Canaan outdoor kitchen, it looks beautiful when paired with round Connecticut fieldstone, and it is also extremely low-maintenance and durable. Better yet, if the soapstone gets scratched, it can be easily sanded down to look like new. As a bonus, this outdoor kitchen also features pool towel cutouts to further enhance its usability. At Odd Job Landscaping, we take the design and creation of outdoor kitchens seriously. We know that the kitchen is a key part of your patio and we go above and beyond to ensure that yours is everything you dreamed of. Contact us today to see how we can bring the enjoyment of an outdoor kitchen to your home.